Collecting competitor data and deriving the relevant information is only one half of competent competitor monitoring. Inventors and patent professionals must also analyze and convert this relevant information into actions. It is important to keep tabs on competitors not just to learn their actions but also to benchmark and hone against their technologies and strategies. However, the immediate question that comes to mind would be: With different stages available in a typical patent lifecycle, which ones should be monitored and most importantly, how to efficiently monitor these stages. Each stage comprises its own opportunities and threats which can be utilized effectively to improve competitor monitoring and safeguarding patent assets if extracted and analyzed correctly. This post discusses the significant stages to be monitored in a typical patent lifecycle while answering why and how to monitor using technology enabled alerts. The publication stage is the first place that everyone should start competitor monitoring. Discover new innovations: It is also critical to locate the new entrants who could become a potential threat. It also helps in staying up-to-date on the current trends of the relevant market in order to stay ahead of them. Avoid unnecessary stress: In the IP world, due to the “First to File” concept, it is very common to see someone else file an application for an invention which is still under your idea formation stage. Follow your competition: R&D and C-level teams can amend their IP strategies proportionately to their competitors based on their patent publications. 1) MaxVal's Patent Publication Alert sends a custom email alert right to your inbox whenever a new patent application matches your interest or requirement gets published. The frequency can be set weekly, bi-monthly, or monthly as per your convenience. You can fine tune the search criteria as you wish and follow by assignees, inventors or technologies in the US, PCT, and EP. Now that you have found who to follow based on the applications published it is important to zero in on the published applications of your interest so you can keep an eye on them throughout the prosecution. Here are a couple of patent prosecution resources worth monitoring. Latest IFW updates: The “Image File Wrapper” tab will show you what was filed by the applicant, accepted or rejected by the examiner, and how the applicant responded. You will be able to see all of the office actions that have taken place between the USPTO examiner and the applicant. Continuity data: tells you if a patent of interest is a continuation application, or the parent of a continuation application. These two alerts enable the attorneys to track their own applications as well as the competition’s. As Publication Alerts, the frequency and search parameters can be customized. 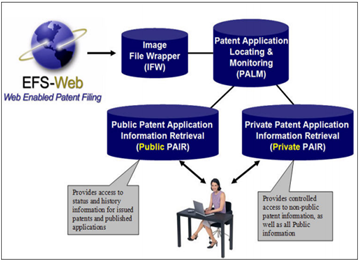 2) PAIR-Alert for Public PAIR offers PAIR/EPO patent prosecution status and IFW updates patent applications. 3) Max-PAIR for Private PAIR automatically logs into the USPTO Private PAIR using the attorney’s PKI certificate number and fetches PTO activities and prosecution status for applications associated with a customer number. Through the patent process, the applicant can challenge the examiner’s decisions or a third party can challenge the validity of an issued patent with the PTAB. The Patent Trial and Appeal Board’s duties include review of adverse decisions of the patent examiner, review of appeals from the applicant for re-examinations, derivation proceedings; inter partes and post-grant reviews, and rendering decisions on interferences. Keeping a track on these trials and appeals will give you an opportunity to stay on top of what is happening around the application/patent of your interest. 4) MaxVal’s PTAB Review Alert is an easy way to follow Interference/Post Grant and Inter partes review as they occur at the PTAB. This custom alert will deliver the patent bibliographic details and a docket report with searchable files of documents filed during the review process. Your competitor monitoring effort does not end at the prosecution stage or even after a patent is issued. A constant watch at this point helps you to proactively monitor if the patent of your interest is litigated as well as to gauge the filing trends, patterns of case outcomes, plaintiffs and defendants, etc. This is not only to understand current affairs but also to be prepared to handle future threats. 5) Litigation Daily Alert is a custom alert that helps patent litigation attorneys keep up with the litigation trends and learn how a patent was dealt with in earlier cases so they can alter their strategies if needed. It is a targeted email which contains all new and closed ECF, PACER and ITC cases.